A small list of movies in which we can see Zoe Saldana will reveal some of the biggest names we seen on the big screen. Her first big success was in the movie Center Stage, a movie about dancers that come together for a common cause. Later we got to see this great star in movies such as Pirates Of The Caribbean: Curse Of The Black Pearl, Star Trek and Avatar; all these movies had great success. You may also know her from The Losers and Takers and at the rate that she is going we can only expect to see her only in Hollywood successes. She is a very classy movie star and also a great looking female. Her style is a combination of glamour and classical tendencies and she always pulls it off and looks amazing. We saw her wearing superb outfits on the most important events where she had important nominations; we also got to see paparazzi pictures of her in casual outfits and she always has that great smile and a perfect choice in wardrobe. Walking from her car, as we can see in this picture, she manages to keep her great style with a casual outfit and with the perfect accessories. Along these accessories, we can notice the Christian Dior Libertine Hobo handbag, a superb choice on her part because it goes perfectly with her look and it is also the latest fashion. 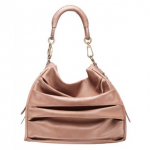 This handbag is not just a looker but it is also quite practical due its large size and very comfortable handle. The design is nothing less than perfect, as we are used from such a big designer such as Christian Dior and the color is also easy to match with different casual outfits. We can only wait and see in what movies we will get to see this great movie star again; one thing is for sure, she is just getting started and we will see more of her. She is already set to appear in the drama thriller The Words in 2013.